The Sou’Wester had done an excellent job reporting on the many initiatives underway at Winnipeg’s Brady Resource Management Centre. I’ve toured the Brady site multiple times since being elected, and this is both an accurate and well written article. In addition, the side article about Wood Anchor is also informative and accurate. Many of you may be familiar with the large, beautiful wooden benches located at the St. Norbert Farmers’ Market – these benches were hand crafted by the talented artisans at Wood Anchor. 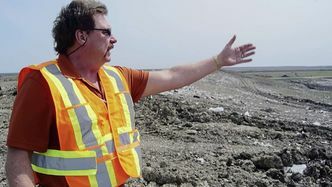 Atop packed clay, plastic bags, old mattresses and unidentifiable refuse, Randy Park surveys a dusty slope at the Brady Road Resource Management Facility where heavy machinery is packing trash into the ground. Park, the City of Winnipeg’s acting manager of solid waste services and supervisor of waste diversion, says the active cell — a mammoth plot of land stretching from the dump’s boundary at the south Perimeter Highway to Charette Road — will be filled by 2022, a mere six years away. At that time, the footprint of the dump — which opened in 1973 and has a lifespan of 100 years — will inch closer to the 790 hectares it will cover when it’s full. DANIELLE DA SILVA – SOU’WESTER: Randy Park says the volume of material coming into the 4R Winnipeg Depot has been surprising. DANIELLE DA SILVA – SOU’WESTER: The city’s yard waste composting operation covers eight hectares and diverted 30,000 metric tonnes of waste from the landfill last year. DANIELLE DA SILVA – SOU’WESTER: The Brady Road Resource Management Facility’s active cell will be filled within six years. “It will be here long after you and I are gone,” Park said as the wind whipped up the scent of rubbish into the mild spring air. In 2011, the City adopted its Comprehensive Integrated Waste Management Strategy in an effort to slow the growth of the Brady Road landfill and to divert waste for other, more productive purposes. The primary objective of the strategy is to achieve a waste diversion rate of 50 per cent by 2020. According to Park, the City reached its diversion rate target of 30 per cent in 2015 despite a 1,800 metric tonne increase in waste coming into the dump (a number that correlates with population growth). With approximately 200,000 tonnes of garbage going into the landfill per year for the past decade, waste diversion is not only good for the planet, it also affects the City’s bottom line. Earlier this year, the City officially opened the Brady 4R Winnipeg Depot. The $5.2-million recycling centre at the dump changes the way citizens interact with the landfill, allowing them to recycle hazardous materials, large plastics, appliances and many other items that haven’t traditionally been accepted as recycling. The goal of the 4R Winnipeg Depot is to divert up to 10 per cent of the material currently dumped in the landfill. Household hazardous waste such as motor oil, paint, fluorescent lights, electronics and many other materials can be dropped off for free at the depot, and producer responsibility agencies collect or purchase the material for recycling or to dispose of them safely. Though the program is still in its infancy, Park said he’s surprised by the volume of material coming into the depot. “What it’s doing is saying ‘Hey we have opportunities to divert this material and take this material and give it useful life other than just burying it in the landfill,’” he said. Composting at the dump is also reaching new levels, with over 30,000 tonnes of yard waste being composted instead of landfilled in 2014. The compost created at the dump is used to cap off the cells and eventually the City hopes to use the material in parks, athletic fields, and even as a resource to be sold back to the public. The operation is so successful, the eight-hectare composting pad site will likely be expanded in the future. “I like to say that we have a really good problem of too much material, and it’s a good problem to have because everybody is participating,” he said. In 2015, the City also launched a biosolids composting pilot program at Brady which diverts up to 25 per cent of the 50,000 tonnes of human waste that ends up in the landfill after it is treated at wastewater management plants. “It would have been going into the landfill but now we’re turning it into a resource to be used on top of the landfill, and by the way, our first batch passed category A compost,” Park added. Moving forward, the City is looking at the potential of expanding its organic waste composting program to include kitchen waste (organics represent about 40 per cent of the City’s waste) and even collaborating with Manitoba Hydro on a microturbine to turn methane gas captured at the dump into electricity. In the 2016 budget, $200,000 was dedicated to studying the feasibility of the project. From feces, to diseased wood, to table scraps, to greenhouse gases, materials destined for the landfill still have potential given the right mindset. When it comes to diversion, creativity is also a deciding factor in what gets repurposed or recycled. Without an end use, garbage is simply garbage. The City is currently on the hunt for innovative entrepreneurs who would be interested in opening up shop at the landfill in a “green business park” and repurposing materials that would otherwise be buried. While interest in the green business park has been slow to materialize, Park said the opportunity is there and organizations such as WRENCH, which recycles bicycles, and Wood Anchor, which repurposes old wood, are good examples of green industry. A few kilometres away from the dump, J Neufeld oversees the operations at Wood Anchor. The design agency and carpentry shop has a contract with the City to repurpose elm trees which have been cut down to control Dutch Elm Disease. Each year, the seven-person business diverts between 200 and 400 tonnes of diseased and salvaged wood from the landfill to be used in beautiful pieces of furniture and artwork. “When I started it wasn’t even from an environmental standpoint,” Neufeld said. “It was more just because the wood was so beautiful. “The growth rings are a lot different on the trees and when you’re dealing with recycled wood, especially old timbers, you see a lot of the scarring from years of use, the darkness around the nail holes, the cracks, and it has a really nice story to tell,” he said. Wood Anchor’s work can be found throughout Winnipeg at The Forks market, local brewing companies, and in the dining rooms of homeowners. And unlike trendy, cheap home decor, Wood Anchor’s heirloom creations will likely never return to the landfill. “We run the entire business around the idea of trying to be as sustainable as possible with the materials we use, but also with the designs that we use so hopefully the design has as much longevity as the material does,” Neufeld said. Facebook.com/TheSouwesterWPG Twitter: @SouwesterWPG Read more by Danielle Da Silva.